If you are trying to help students develop a growth mindset in your classroom, I hope you have incorporated goal setting into your daily routine. Students can’t truly have a growth mindset without learning how to set, reflect upon, and achieve their goals. Along with the growth mindset talks, posters, and dojo videos, I have created a tool that I use each week in my classroom, and I am blown away at how goal oriented my students have become. Read on to learn more about how I use this tool in my classroom. The very first thing I did was introduce my students to SMART goals. First, I used a 8.5 x 11 printable that I created and posted in our classroom. Then, we talked about what each letter stood for and the meaning behind it. Next, I had the students create their own reference tool in the form of a flip book. Students love cutting, pasting and coloring, so they really had fun creating their flip books! They kept these out for the first couple of weeks, and then they didn’t need them any longer, so they simply put them in their binders. After I introduced SMART goals, I demonstrated how to create my very own goal using our weekly goal sheet template. This walks students through the goal setting process ensuring their goals are SMART goals. After I demonstrated, I allowed students to attempt creating their own goals. At first, they struggled with the measurable part, but after a few examples and clarification, they were understanding much better! Students only fill the top part out. I have them create new goals every Monday. Students must revisit and reflect on goals daily! This is one of the most important components of maintaining the growth mindset. I give the students 5 minutes before lunch to revisit their goal. During this time, they record any accomplishments, challenges, ideas they get from others, etc… on their journals. (I simply copy this page to the back of the goal sheet to make things easier.) They love sharing their accomplishments with me, and it really helps develop a completely different mindset! It is an awesome thing to see develop. On Friday, we reflect upon our goals! This is my favorite part. Students get to circle YES or NO depending on if their goal was met. (I always model the first week’s goal and make it a point that I do NOT meet my goal! It’s important to let students know it is okay to fail! I will try it again next week!) Students also reflect upon their in class behavior and effort using a rating scale. I take these up, put my comments on the bottom and send them home to be signed. Parents love seeing the types of goals their students are working for, and many times, they like to get involved in helping them meet their goals! The students turn these in on Mondays and I keep them in their file. This is a great tool for documentation of parent involvement as well as any behavior concerns you may have documented and shared with parents. If you would like to get a copy of this year long tool to use in your classroom, you can click the link below. It is almost that time of year again! Do you have all your posters printed and laminated? Have you thought about classroom rules and procedures? Rules and procedures are one of the most important components of a well ran classroom. I love having the students create their own rules, but I also find it is necessary to bring some rules to the table on the very first day! I have saved the creating process for specific activities such as group work rules, playground rules, etc… It is important to allow students to feel they have control over their learning. Having them create the rules for certain activities does just that! It is crucial that you keep these rules posted throughout the year, so you can refer back to them. If you haven’t already created your class rules posters, I have some you can download in my TPT store. These are EDITABLE <– YES! You can use the rules I have made, or you can create your own using the blank background included. CLICK HERE TO DOWNLOAD THIS FILE FOR YOUR CLASSROOM. It is not going to do much good just talking about the rules at the beginning of the year. Students need to practice what following the rules will look like. I also have the students give non examples of following the rules. At the beginning of the year, the students create their own rules booklet! They love writing about why each rule is important, and they also get to draw what following the rule looks like to them. Their favorite part is sharing their illustrations with the class! This rules booklet is also included in the editable rules packet! If a student doesn’t follow a rule, what will you do? You must communicate this to the class. Consistency in your expectations is so important in maintaining a well ran classroom. This doesn’t mean you have to scream and yell when a student doesn’t follow a rule. I simply speak with the student and have them fill out a think sheet. I can do it with a smile. It does not require me being upset with the child. Teaching them how to behave is a process just like teaching them how to add and subtract. In the rules packet, I have included an editable think sheet that I use throughout the year. Students and parents are required to sign this, too. It is great for documentation! I hope these tips have helped you think about how you will introduce and enforce classroom rules in your class. To download this product, please click here! Teaching students to demonstrate good behavior can be quite a task! I think it is important to integrate character education in lessons, model good behavior on a daily basis, but perhaps the easiest and quickest way to see results is to offer a little motivation! In my classroom, I have many different techniques that I use to manage behavior. I will eventually share some of those, but I am going to start with my strategies for managing behavior in the hallway. Anyway.. the reason I am sharing my line up procedure is because if you are wanting the students to act nicely in the hallway, you are going to have to get them started that way before you walk out the door! Don’t let them leave until they are behaving appropriately. What do I do with this stick? Well, the “Mystery Walker” is a special person who I am “keeping my eye on” while we go down the hall. If this person exhibits positive hallway behavior (we talked about and established what that looked like at the beginning of the year), they will be rewarded when we get back in the room. It is really neat because the kids don’t know who the mystery person is, so in hopes that it is them, they are usually on their best behavior! 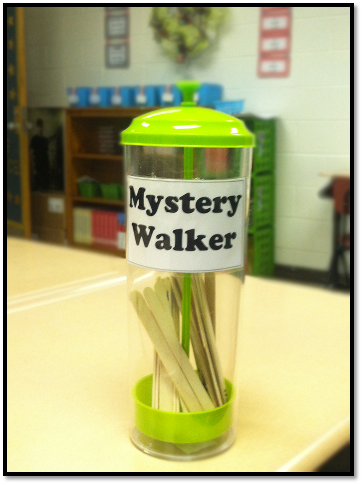 When we get back in the room, I announce that, as soon as everyone is sitting quietly, I will reveal the mystery walker! What does the mystery walker get? 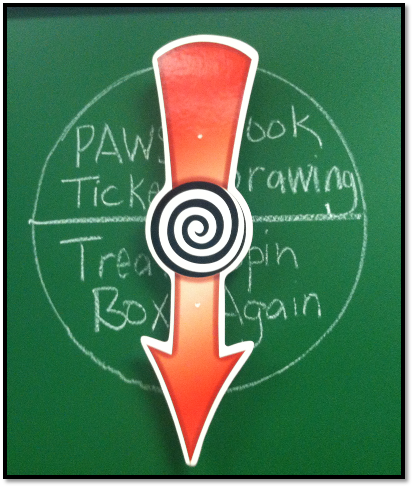 Well, I frequently reward my students, and one of the ways is allowing them to spin our classroom spinner. (See the picture on the left.) I purchased this spinner from Scholastic, but you can also get them at Walmart. Click here to purchase. You can even find free electronic spinners that you can display on your Smartboard, or ipad! I like using spinners because, well, they are just fun! It adds an element of surprise in there. The rewards listed on your spinner can be completely original to you and your classroom. I chose simple, inexpensive things because I use the spinner a lot, and us teachers are on a budget! 🙂 The kids especially get a kick out of the “spin again” option. You know your kids and your budget, so you can chose rewards that work for you!! Some sort of can, bucket, etc.. to put your Popsicle sticks in. 1 Popsicle stick for each student with his/her name on it. A classroom spinner (or other reward option) with prizes/rewards. 1. Line the students up. 2. Draw a mystery walker. 3. Keep an eye out on the mystery walker while walking in the hall. 4. Reveal the mystery walker when the students return to class. I hope I was able to effectively communicate what this looks like in my class. I have used multiple other reward systems in the past for hallway behavior management, (stamps, stickers, points, etc..), but this one seems to me the simplest, most effective system so far. As always, you know your students more than anyone! My advice is to try new things, and if they don’t work, try something else until you find whatever works for you!